This post was originally published on the Gates Foundation’s blog, Impatient Optimists. “After I lost Nomthunzi, my life was never the same again. I cried for a long time.” Despite the grief of losing her husband and baby, Nomthunzi, to AIDS, Florence Ngobeni-Allen pressed on and became an ambassador for the Elizabeth Glaser Pediatric AIDS Foundation (EGPAF) to educate women about the importance of HIV testing and stopping the transmission of HIV to their babies. Times have certainly changed for many who live with HIV/AIDS. Where once being diagnosed HIV positive was a definite death sentence, particularly in the developing world, many people can now live and thrive with HIV/AIDS, including babies. Nine-hundred babies are born with HIV each day, according to the Elizabeth Glaser Pediatric AIDS Foundation (EGPAF). In a recent online discussion with the foundation, bloggers were told that without treatment 50 percent of these babies will die before their second birthday. Today, around the world, 34.2 million people are estimated to be HIV positive and 3.4 million of them are children. Two of the foundation’s ambassadors, Florence Ngobeni-Allen and Martha Cameron, are HIV-positive. They are also mothers who spread awareness to other mothers about mother-to-child transmission of the virus (passing the virus from the pregnant mother to her baby, in utero). They stress to mothers globally that even though they may be HIV-positive their babies don’t need to be born with the HIV virus. In fact, 100 percent of all mother-to-child transmission of HIV is preventable. During the discussion both Ngobeni-Allen and Cameron repeated that the first step in decreasing the rate of mother-to-child transmission of HIV is through testing. When a woman knows her status she can prevent her baby from being born with HIV. Martha Cameron grew up in Zambia and watched as countless members of her family passed away from AIDS, including her mother when Cameron was only 23-years-old. After severe bouts of illness both in the United States and Africa, Cameron tested positive for HIV in 2003. Despite her status, Cameron got married in 2007 and shortly thereafter she and her husband decided to have children. “For African women it is such a big deal,” said Cameron. “It’s dignity for a woman to have children.” Through education from her doctors and prevention of mother-to-child transmission of HIV Cameron has delivered two HIV-negative babies and her husband continues to be HIV-negative as well. Florence Ngobeni-Allen’s story is different because she lost her husband and her baby daughter, Nomthunzi, to AIDS in South Africa in 1996 and 1997 respectively. In those days there were “no antiretroviral medicines available for children at that time in South Africa,” Ngobeni-Allen wrote in her personal story. Now, Ngobeni-Allen is a wife and mother of a HIV-negative son and husband. Today there is no reason for babies to be born HIV-positive. Through early testing, education, and prevention of mother-to-child transmission of HIV every baby can be born HIV-free. Today, UNAIDS, the Joint United Nations Programme on HIV/AIDS, held their first Google+ hangout with UNAIDS Executive Director, Michel Sidibé, global ambassador for the Elizabeth Glaser Pediatric AIDS Foundation, Florence Ngobeni, and HIV/AIDS activist and singer Annie Lennox. With World AIDS Day quickly approaching on Saturday there are many conversations about HIV/AIDS and what needs to be done in order to completely create an AIDS-free generation. You can watch the hangout below. It lasts roughly 30 minutes. Some key tweets from our Twitter handle and others at the #ZeroHIV hashtag are below. World AIDS Day is quickly approaching on December 1 where the global community comes together to remember those who have succumbed to HIV/AIDS and also push for an AIDS-free generation. Last week UNAIDS released their new global report on the HIV/AIDS (download: PDF) that showed significant movement in the reduction in new HIV cases. New cases were down to 2.5 million in 2011 from 3.2 million in 2001. The report also highlighted that more people are living with HIV and have access to antiretroviral therapy, currently a 63% increase from 2009- 2011. 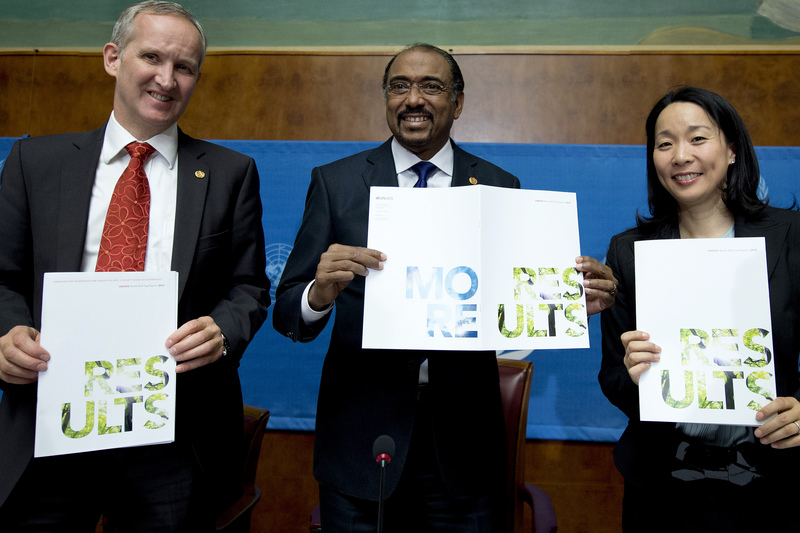 Michel Sidibé (centre), Executive Director of the Joint UN Programme on AIDS and HIV (UNAIDS), with Bernhard Schwartländer (left), Director for Evidence, Strategy and Results at UNAIDS, and Annemarie Hou (right), UNAIDS’ Director of Communications, holds up the organization’s new Results Report on HIV, launched during a press conference today in Geneva, Switzerland. According to the report sub-Saharan Africa still claims the highest number of HIV positive people followed by the Caribbean, Eastern Europe and Central Asia. In fact, women account for 58% of people living with HIV in sub-Saharan Africa. Optimistically, the overall rate of HIV infections has been reduced 50% since 2001. The greatest reduction is being seen currently with newborns. According to the report in 2011, new infections in children were 43% lower than in 2003 and 24% lower than 2009. While key HIV/AIDS statistics are improving there is space for better results. The overall number of new HIV cases need to be drastically reduced and more people need access to antiretroviral drugs. An estimated seven million people still need access to life-saving drugs . There is also a funding gap that will prohibit marked improvements unless more money is pledged by both poor and middle-income countries and the international contributions are sustained or increased. Today is World Pneumonia Day. Why? 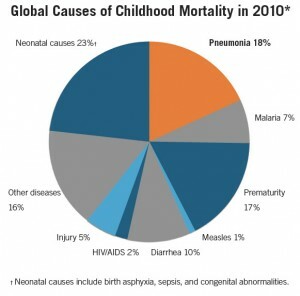 Pneumonia is the leading killer of children under five. 1.3 million people dies of pneumonia last year and 1 in 8 children were a part of those mortality figures according to worldpneumoniaday.org. Pneumonia is an infectious, bacterial disease that adversely affects one’s lungs. Also, mothers can protect their children against pneumonia through exclusive breastfeeding for the first six months of their baby’s life. Regular handwashing cuts down germs and pathogens. Additionally, using clean cookstoves helps to reduces the risk of pneumonia. “Pneumonia can be prevented and cured. Yet, for too long it has been the leading cause of global deaths among children. We know what to do, and we have made great progress – but we must do more. We must scale-up proven solutions and ensure they reach every child in need,” said United Nations Secretary-General Ban Ki-moon. Spread the word about World Pneumonia Day through social media. Read 5 Things You Can Do.